Today was a good day, for a number of reasons. The current R&D promotion is one I’ve come to ‘greedily enjoy’ like a Ferengi counting latinum. First – you get much needed resources from the boxes themselves. Whether you like to craft (I do), or you simply break them apart for resell, the R&D packages on a normal day are a great deal. Secondly theres a chance to get the Sheshar Dreadnought – this time with the option of selecting either the Command version or the Intel version. So you buy 1 box, and open it to find either an R&D box + 10 lobi, or if you’re really lucky you might get a Sheshar. With the R&D bonus weekend, you also get a second box – the R&D Weekend Booster Box. I don’t remember if this happened last time, or if the box was a vr version – but man is it worth it this weekend. For me the most valuable item are the Major Research boosts which are critical in reducing your costs when going for Epic results. In the early days of R&D, resources boxes were worth more opened and resold for EC. As the market has stabilized and more people are crafting, the value of these boxes as resale items have fallen within the same value as reselling keys. As a side note I save my reward boxes throughout the month, and open them all on R&D weekends. Better return (*ducks the hate mail, while waiting on the Nerf Hammer). This weekend with the bonus box, the value of the rewards exceed (in some cases greatly) your expense. Need EC? This is the weekend to splurge to flip the contents. Note that the market fluctuates – you might want to wait for a few weeks to sell the content for a better return. If you’re new to my blog, you know I’m not a fan of the lockbox in general. With rare exception lockboxes have little in terms of resale value. It’s not as bad as a lottery, but the conditions are the same. I spent ridiculous amounts to get the Wells via keys, when the simpler method would have been to sell the keys and by the darned thing outright. The last time this promotion was around, I lucked out getting the Sheshar within the first 10 boxes I opened. I didn’t keep the ship – sold it to help finance upgrading my alts. (Still think the upgrade costs are ridiculous). Tonight, partly to celebrate a great day at work (presented the initial designs for a new website) I splurged and dropped $100. This was the result. No photoshopping here. No fibbing. Unfraking believable. I’m almost wondering if either I’ve made a friend of RNG God, or maybe Trendy sprinkled magic pixie dust, or just maybe I really lucked out. 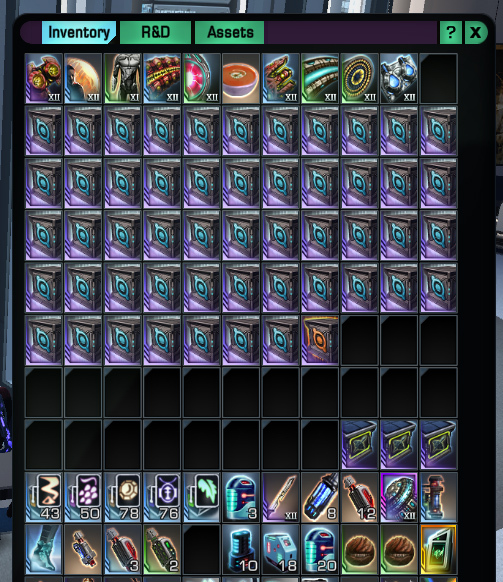 For the dedicated ship collectors, I opened the boxes at ESD in the same instance all at once. Previous Previous post: News Round-Up – Holodeck Updates, a new mission delayed, and a rumour quashed.